Kölle meets Rio – Carnival across borders? Carnival, though celebrated in many places around the world, is a deeply local affair, a matter of local civic pride, including jokes about those who are not locals (in Cologne, such jokes are likely to be about the inhabitants of the nearby town of Düsseldorf). 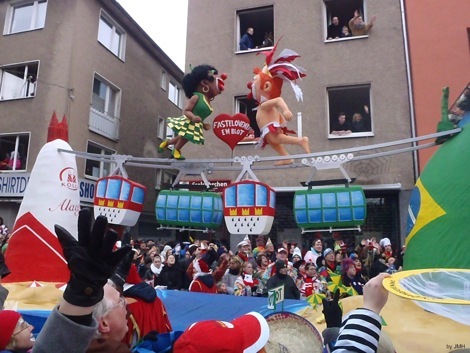 This year, however, Cologne, the capital of German carnival, themed its celebrations “Fastelovend em Blot, he un am Zuckerhot“ which in local dialect means „Carnival in our blood, here and at the Sugar Loaf Mountain“ – a reference to Rio de Janeiro, with whom Cologne was twinned in 2011. On the other side of the Atlantic, Unidos da Tijuca, one of the most successful samba schools in Rio de Janeiro, appeared as „Samba da Alemanha“ at the annual samba contest in the Sambodromo. Is carnival going cosmopolitan? Or has it never been as local as my Cologne experience made be believe? I think neither of the two is the case. From the 18th century onwards, civic localism was an essential part of modern carnival and still is today. What has changed, though, is the reach of the cosmopolitan outlook in which this localism is articulated. In Cologne, yesterday more than 11.500 activists, 130 music groups, and one hundred wagons accompanied by 800 attendants formed a line of more than 7 km length for the traditional Rose Monday parade. More than 1.5 million spectators watched the parade on the roads, and many more followed it on television. More than 150 tons of sweets (called “Kamelle”), including 700.000 chocolate bars, and 300.000 bouquets of flowers (called “Strüßjes”) were thrown into the crowds. Estimated overall costs: 2.3 million Euros (see official webpage of Cologne carnival). That all sounds pretty much like a megalomania – but Cologne is still a Benjamin compared to its new partner city. Rio de Janeiro considers itself proudly the world capital of carnival. 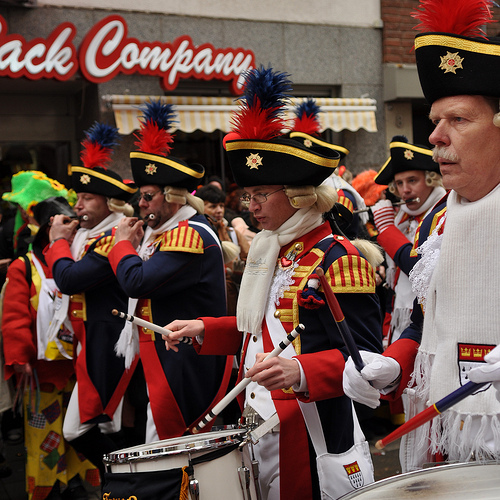 Like in Cologne, carnival is the result of 8 months of preparation. Up to 12 samba schools, each with around 3.000 members compete over several days in the Sambodromo for the position of Grand Champion. Each night, 90.000 people are watching live, not to mention the millions following the contest on television. Some 6 million revelers are expected to spread over 492 street blocks and almost 700 parades. Foreign visitors alone are estimated at more than 500,000 this year. Estimated costs: 4.4 million Euros – just for the “Samba da Alemanha” parade of Unidos da Tijuca (see Süddeutsche Zeitung). In both cities, carnival is an important part of local identities, popular culture, social organization and economic life (just think of the role of the carnival associations). This has been the case from the beginning of what can be considered as modern carnival in the 18th and 19th centuries, as a short historical review reveals. The roots of carnival trace back to ancient Roman celebrations around solstice and spring. As discussed in my blog entry on the transnational origins of modern Christmas, the whole winter period was a period of carnivalesque feasts and activities which ran into early spring and ended with the beginning of the fasting period before Easter. While the Catholic church tended to tolerate carnival, protestants attempted to repress it. The result is still observable in the geographic distribution of strongholds of carnival in Germany, but also worldwide: Carnival tends to be concentrated in regions with a high proportion of catholic, and to a lesser extent, Greek orthodox populations. There is hardly any carnival in the UK or the US, with the exception of French and catholic New Orleans. Notable exceptions from this rule are Basel in Switzerland, which has its own carnival tradition despite being protestant, and the Philippines which do not have any significant carnival but a large catholic population. In the 19th century, authorities as well as members of the rising urban bourgeoisie even in largely catholic regions became increasingly concerned with carnivalesque indulgences as a threat to social order. They feared subversion and resistance. Merchants, professionals, entrepreneurs as members of an emerging civil society sought to organize, control and monitor carnival activities. Modern carnival was organized carnival. The development of carnival in the German Rhineland, analysed as „regimenting revelry“ by Elaine Glovka Spencer in articles published in Central European History and the Journal of Urban History, provides an informative account of these changes. Photo attributed to the public domain by the photographer, http://commons.wikimedia.org/wiki/File:K%C3%B6ln-Rosenmontag-Neumarkt-1836.JPG?uselang=de#filelinks. 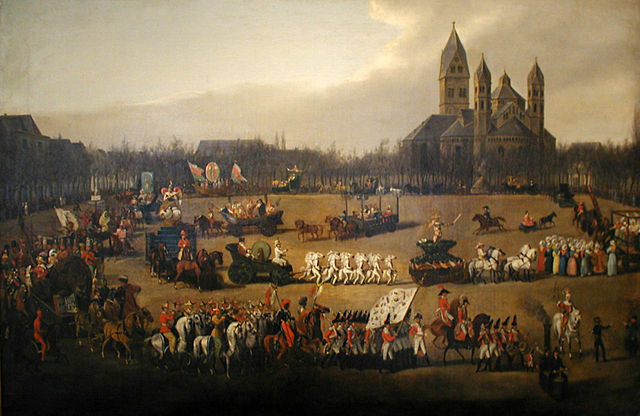 Following the Napoleonic occupation of the Rhineland, which prohibited public carnival activities, local merchants, professionals and businessmen in Cologne and other cities in the region organized in voluntary associations. Their aim was – and still is – to foster local folklore, culture and community-building. From the beginning, their concern was to balance carnivalesque activity with the maintenance of social order – hence the multitude of rules and conventions which still govern carnival today here. Already in the 19th century, the importance of carnival for the local economy was stressed. Together with tourism, a well-moderated carnival was presented as a well-deserved recreational activity for the (male) middle classes who dominated carnival associations at that time. As other social strata aspired to influence, the number of voluntary associations increased and committees were founded to coordinate preparations between them (apparently a succesful import of a model invented in Nice). Despite internal tensions, their self-defined mission as guardians of local identity and tradition brought together representatives from different social strata (with women fighting their way from Altweiberfastnacht – old ladies’ carnival – into mainstream carnival). This mission, however, required significant boundary-drawing activities towards neighbouring cities. Cologne, Düsseldorf, Mainz all engaged in fierce but friendly rivalry. Carnival in these cities was – and is – hardly imaginable without jokes and satire about the “otherness” of their rivals. The Portuguese first brought the concept of carnival to Rio around 1850. By that time, Brazil had already gained independence but the Portuguese bourgeoisie kept an influential role in society. According to the account provided on rio.carneval.net, the practice of holding balls and masquerade parties was modelled on Venice but imported from Paris by the city’s bourgeoisie. 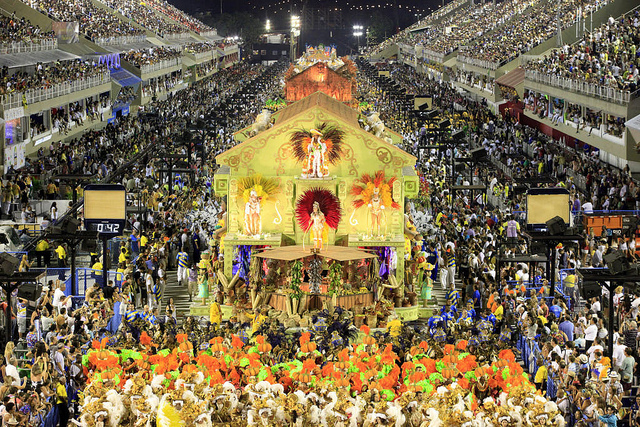 However, the Brazilians soon transformed the imported European traditions into their own unique carnival. At first, older Iberian carnival traditions of the entrudo (street-based activities involving jokes and water fights) became replaced by the imported Venetian-style carnival from Paris, consisting of street parades with horses and wagons, and indoor masked balls for those who were admitted and could afford them (mainly the white population). Yet since the 16th century, Brazil had also had lively African and Indian carnival rituals and celebrations practices among the slaves brought in large number to the country in the context of the colonial transatlantic trade triangle. In the second half of the 1880s, and particularly as the abolitionist movement gained momentum, leading to emancipation of slaves in 1880, black Brazilians formed their own parades, dancing to African rhythms in the streets of Rio and other cities. Many of them were migrants from the north-eastern parts of Brazil. John Charles Chasteen in the Journal of Latin American Studies argues that two different strands of Afro-Brazilian dancing styles started to merge with a third, less African element (a marching style apparently more similar to classical Cologne carnival music) into the forerunners of modern samba music. The first samba schools in the 1920s consisted exclusively of dark skinned people originating from the favelas and shanty towns of Rio. In the 1930s, they became increasingly subsidized by the government, which helped their expansion. Chasteen argues that the rise of samba to its current prominent symbolic position as representing the Brazilian national identity was very much forged in the first decades of the 20th century. Samba as a blend of African and Portuguese music and dances became regarded as a persuasive symbol of a Brazilian identity of racial mixing linked through carnival to a myth of social levelling. In the 1960s Rio became a destination of international carnival tourism. The construction of the Sambodromo led to a previously unknown medialization of carnival. While the this commercialisation of carnival has certainly tended to colonize African and Indian culture, Chasteen maintains that through carnival, black Brazilians “began to gain a voice in the national discourse of collective identity.” (Chasteen 1996: 46). For pictures from this period click here. Reverse transfers from the Caribbean and Brazil back to North America and Western Europe? To my knowledge, there has been no globalization of Brazilian carnival comparable to that of Trinidad carnival. Keith Nurse, in his study of the Caribbean diaspora, provides a very detailed account of how labour migration by people from Trinidad after World War II lead to a spread of their carnival rituals to other parts of the world. Overseas Trinidad carnivals in Toronto, Harlem or Notting Hill attract thousands of Caribbeans living abroad, and provide them a bond with those staying at home in Trinidad. They help to foster what Nurse calls a pan-Caribbean sense of a transnational community. Yet, in absence of a comparable size of diaspora, Brazilian carnival has also influenced carnival in other parts of the world. 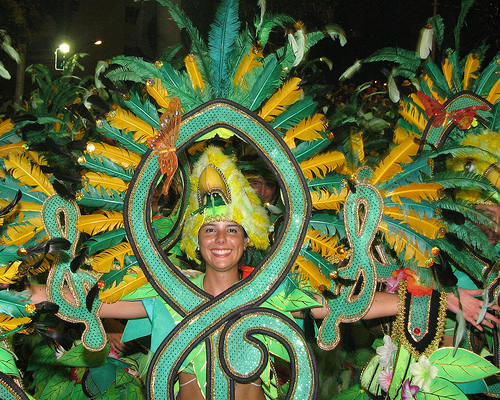 Take for example the Carnival in Cologne: since the 1970s, the number of samba groups participating in parades has been increasing, as has the number of samba groups in other parts of Germany. The 1970s and 1980s were a period during which many Brazilians went abroad for economic and political reasons – including many artists and musicians coming to Germany. At the same time, traveling to Latin and South American became a fashionable thing to do for a young generation of Germans. It was out of such small scale cultural encounters that versions of Brazilian samba made their way into alternative and subsequently mainstream carnival in the German Rhineland. Post-colonial transfers and more recent processes of social differentiation, new technologies, mediatization through television and internet, global tourism and sponsoring by multinationals have transformed the reference point for carnivalesque localism: While in the 19th century, European cities such as Paris, Venice, Nice, Cologne and Mainz engaged in a friendly rivalry for producing the most original and entertaining carnival, nowadays the materials and reference points are drawn from all over the world. In both cities, Cologne and Rio, local traditions have not been eliminated by commercialization, but rather continuously become re-emphasized and stage-managed to attract more visibility, reputation, funding and participants. In fact, carnival seems to be a business very much concerned with presenting and selling as highly localized rituals and traditions what has evolved out of complex cultural hybridization. 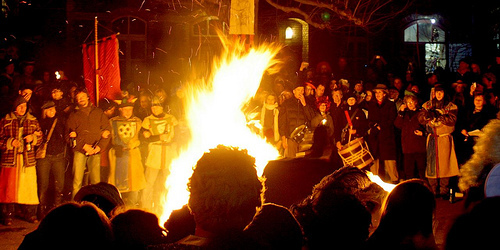 Some of these rituals may be even truly local, such as the burning of a “Nubbel” (a large straw effigy representing a fall guy) after the last dance on Tuesday at midnight – signifying the sad end of the carnival season. On that note, enjoy the last hours of carnival before it comes to a close!